Use Console Pay to automatically receipt rent payments into Gateway without downloading any bank files. Important: Before you start, ensure you have Gateway Connect running on your server computer. (refer to How to Install and Configure Gateway Connect if required). Go to the main menu, click Transactions, then Console Pay. 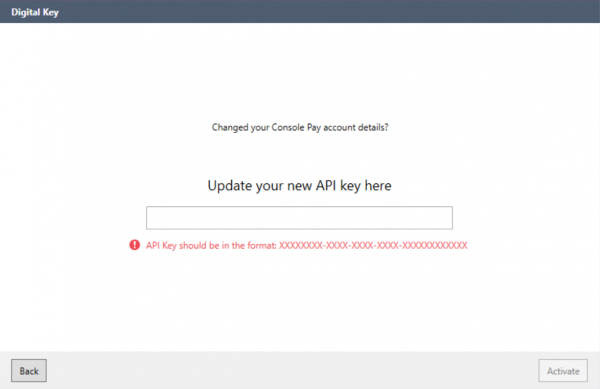 The Add an API Key to start using Console Pay screen displays – Enter the API Key supplied by the Console Pay Concierge Team. Note: The API Key is 32 characters split up into 8 characters, 4 characters, 4 characters, 4 characters & 12 characters separated by a hyphen. (ie. 12345678-1234-1234-1234-123456789012) and is only required to be entered into one office computer linked to your database. When entered correctly a green tick displays. Note: the tick confirms the correct format only it does not confirm the key is valid. 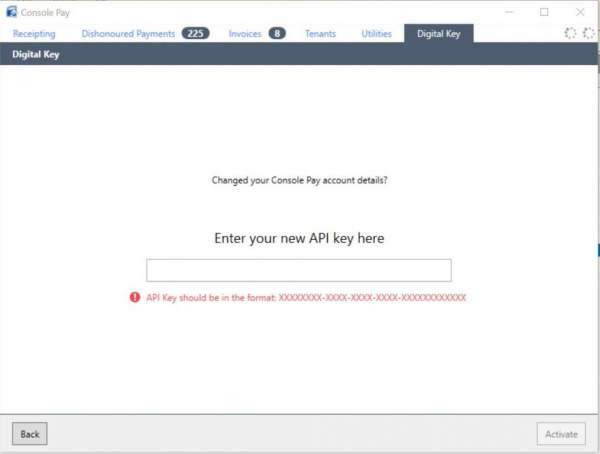 The Add API Key setup complete screen displays, click Continue. Console Pay is now enabled and ready to process transactions (refer to Processing Transactions in Console Pay if required). Go to the main menu, click Transactions, Console Pay. The Console Pay screen displays – from the menu, select Digital Key. Enter the new API Key then click Activate.